The HCR Mobile Robot Kit is a two wheel drive mobile robot platform which has three levels included (if you want, you can use only the parts you need, or make a two level robot). The kit includes two motors, 2 wheels (and one rotating third wheel) and all associated plates and hardware. The supports include spaces for servos and sensors and the base has holes specifically for mini-its motherboards. This is a second release of the HCR. In this update, new motors and new wheels have been updated. The composition of the sensors is changed. Now, there are 6 URM sensors in 6 different directions. And about the new motor, this is DFRobot customized high quality DC motor. The best part of this motor is that it is a quiet and high torque output motor with optical encoder building. The optical encoder gives 663 pulse per rotation which is able to sensor 0.54 degree rotation from the shaft. The resolution can meet a general PID speed control requirements. A new level for users to do more interesting things. Like a Kinect for XBOX 360. Attention: The yellow wires are jump wires. And for this GMR board 3 microcontrollers should be used. Two Arduino Nano and one Arduino Mega ADK. One of Nano to control the motors and the other used to drive 6 URM sensors. And the Main microcontroller is the Mage ADK, it is used to collect the date and transfer it. There are two Wireless slots for Xbee, blueteeth and other wireless communications. In this case, we just need one Nano to drive the motors. 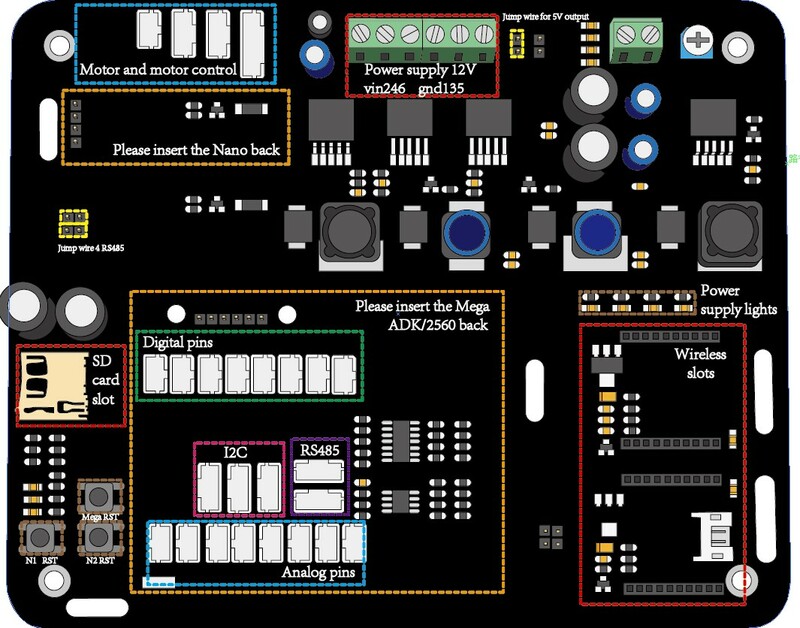 Insert the Mega and Nano on the GMR board, see Picture3 and connect the output of the switch system to the power supply of the motor controller and the GMR board. 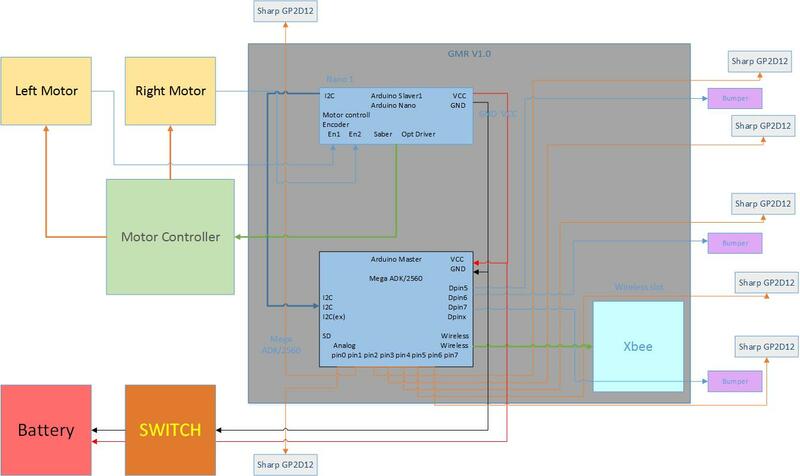 Use the example code of the motor control which have been listed in software architecture. Test the speed and the direction of the motor. Make sure the motor will run suit your need. The codes of the motor control should be used in Nano and the codes of the bumpers and IR sensors should be used in Mega ADK. The communication between Nano and Mega ADK is I2C. After testing the codes you can follow the guide and make the HCR move. Assemble the HCR First, see the assembly guide. Remove the 3rd level and the 2nd level of the HCR. Fix the Battery in the 1st level, connect the switch system as Picture4, and fix the 2nd level again. 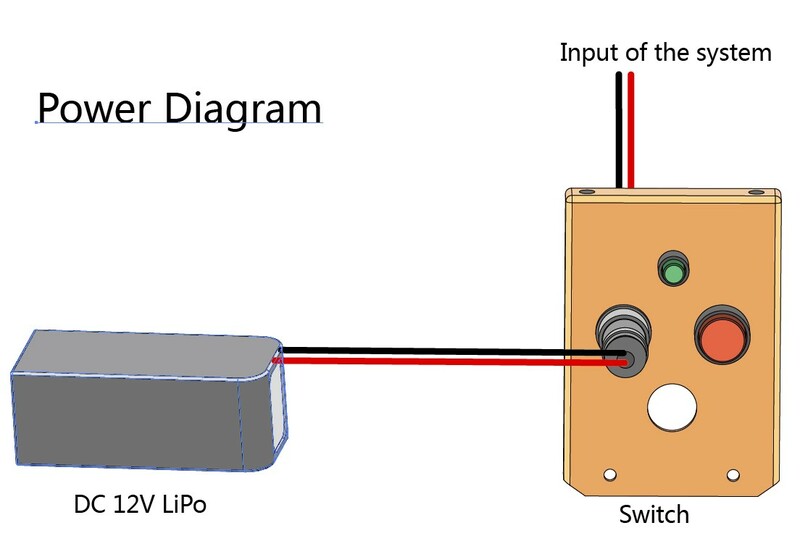 Insert the Mega and Nano on the GMR board and put the GMR board in 2nd level and fix it, see Picture3 and connect the output of the switch system to the power supply of the motor controller and the GMR board. Connect the circuits as the connection diagram (Pictutre2), include two motors, the motor controller, 3 bumpers and 7 IR sensors. And the motor controller can be fixed with the GMR board. According to your choice, upload the code to the Mega and Nano. The example code have been listed in software architecture. And the communication between the Nano and Mega is I2C. And the code on the Nano (motor control) can drive the wheels. Fix the 3rd level again. In this part, the example code of the HCR will be listed, It is written by Arduino, include the motor control, bumper and the IR sensor. 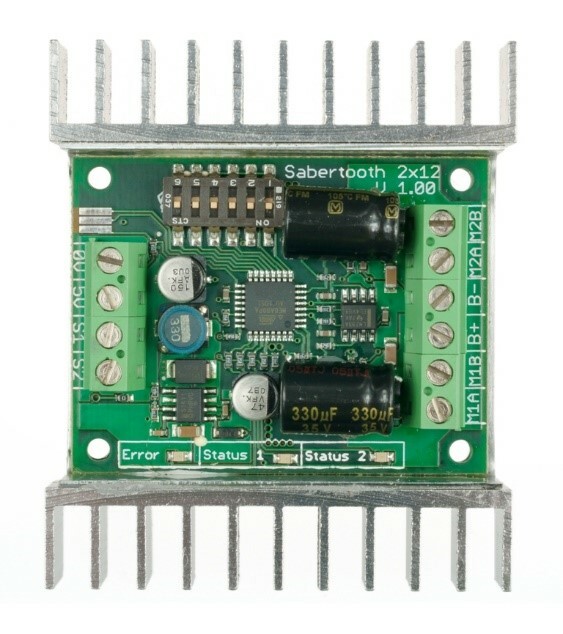 Code on Arduino Nano control the motor: If use the Sabertooth motor control, the motor can be control by <serve.h> perfect. The specifications of all the hardware. Use to transfer the date and drive the Bumpers/IR sensors. 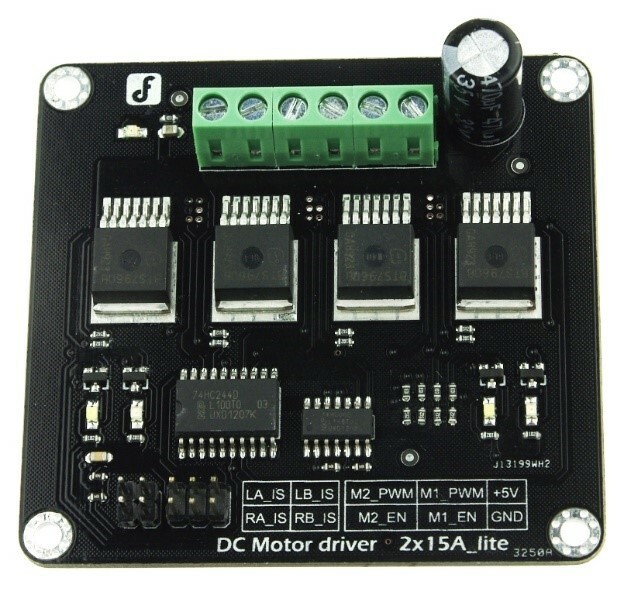 Use to drive the motors and with the help of encoder, the motor can do the close loop. 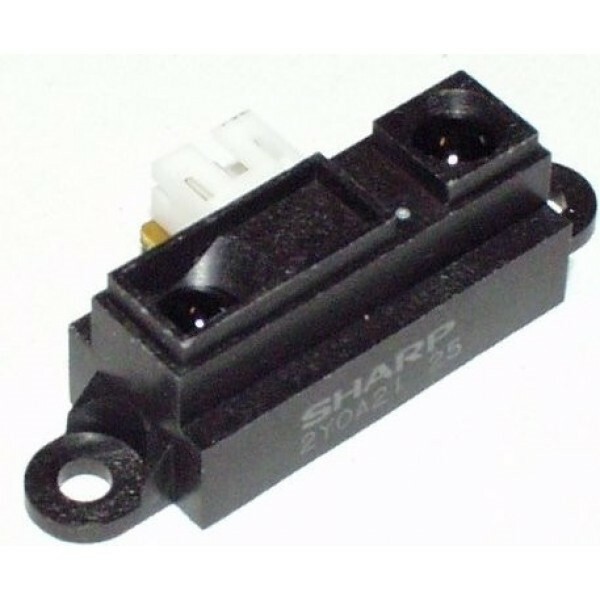 Up to 18V in: 12A continuous, 15A peak per channel. 24V in: 12A continuous, 25A peak per channel. 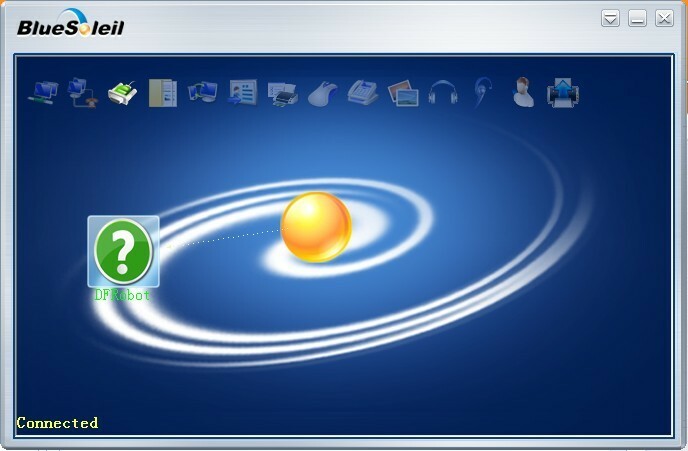 Can be connect on the Master then giving a method to control the HCR by wireless. Get HCR - Mobile Robot Platform (Support Kinect) from DFRobot Store or DFRobot Distributor.